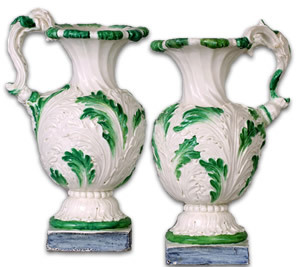 To trace the history of Naples Porcelain you have to look at the origin of Capodimonte Porcelain. In little more than half a century the Royal Factory at Capodimonte produced the finest porcelain and ceramic dinner ware and ornaments in its own superb, unique and complete style. In particular the Bisquit which does not redden with age (unlike those of Saxony and Sèvres) and the miniatures, which are beautifully modelled and of superb detail; and which are said to be the rarest and most prized of all European Porcelain. The father of Capodimonte porcelain is considered to be Charles of Bourbon (1716-1788) son of Philip V of Spain and his second wife, the Italian, Elizabeth Farnese. 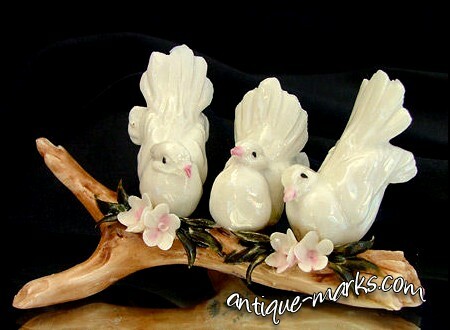 A gorgeous little miniature cabinet sculpture by capodimonte, depicting three fan tailed doves chattering on a branch. The branch embellished with small pink and white flowers. Superbly modelled with bright detailing and loads of movement. Looks absolutely gorgeous. Of significant proportion at 16″ by 10″ and 11.5″ tall. 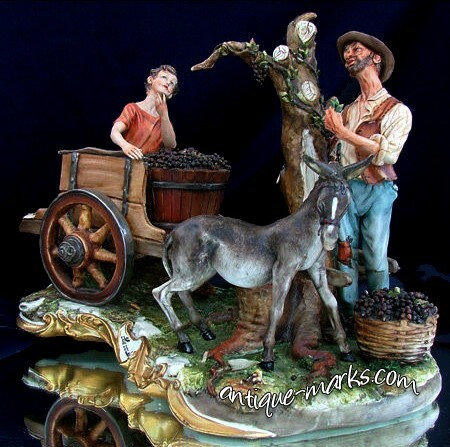 Beautifully modelled and superbly detailed, particularly the cart, the grapes and the Donkeys facial expression as it shies from the nasty frog. With Capodimonte Crowned ‘N’ to the underside together with date cypher. The artists Signature mark, ‘Volta’ to the rear face and the title ‘La Vendemmia’ within an ornately scrolled and gilded cartouche. Painted with a half-length portrait of Prince Charles Stuart, Bonnie Prince Charlie, in armour wearing the sash and star of the Garter and the green sash of the order of the Thistle. Probably painted by Giovanni Sigismondo Fischer after Louis-Gabriel Blanchet. The gold and enamel mounts are by a London goldsmith. Possibly the only example of porcelain from the Royal Bourbon factory of Capodimonte in Naples with an English or Jacobite connection. Filippo Tagliolini worked as a modeller at the Royal Porcelain Factory of Naples and was active between 1771 and 1807. 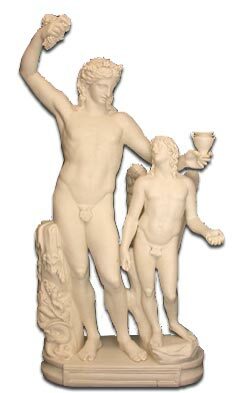 The Judgement of Paris is a bisque porcelain sculpture and one of his most famous creations.